Roland “Rolly” Gentry is a hardened private eye who thought he’d seen it all. But when a mysterious woman steps into his office and asks him to have a “talk” with her ex-husband, Rolly is tossed into a seedy world where not even his entire collection of self-help books and CDs can assist him: Suburbia. As he delves ever deeper into the darkest corners of homeowners’ association politics, he faces a threat not only to the façade of stabilty society presents, but to the inner wisdom within his own secret soul. Director William R. Coughlan and producer Pam W. Coughlan are back with this short for the 48 Hour Film Project, from a script by author/blogger Robin Brande. 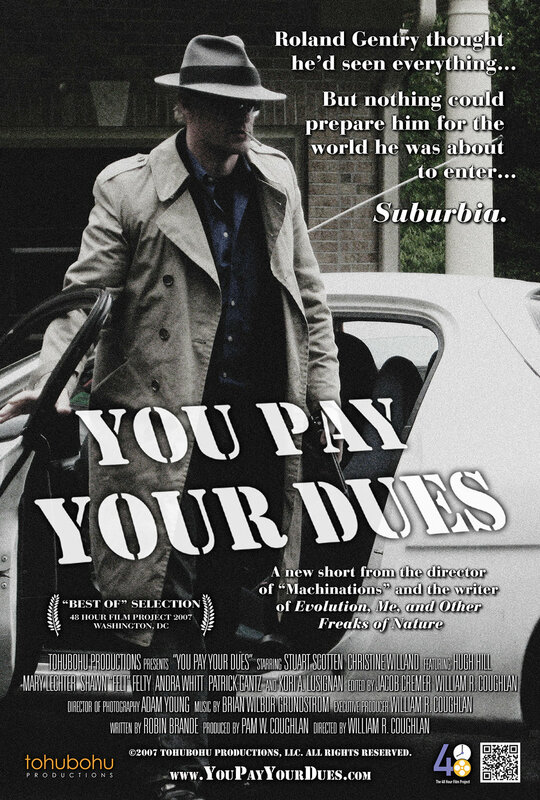 Produced entirely from May 4th through the 6th, “You Pay Your Dues” was Tohubohu’s fifth entry in the competition, and premiered at the AFI Silver Theatre on Thursday, May 10.